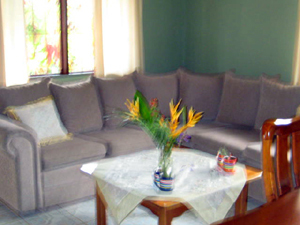 This versatile home or B&B has extra features to enhance enjoyment of tropical life near the village of Sabalito at the northwestern end of Lake Arenal. In addition to the 4 bedrooms and 3 bathrooms, there is a jacuzzi and a very pleasant many-windowed multi-purpose or garden room, which now serves an an exercize room. There are also a large laundry room, two large storage rooms and a "strong room" for secure storage of valuables. 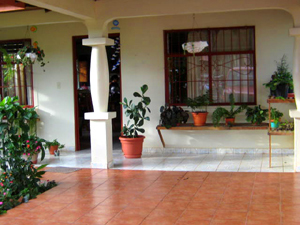 A wide covered porch is one of the attractive places to enjoy the balmy weather and beautiful flora. 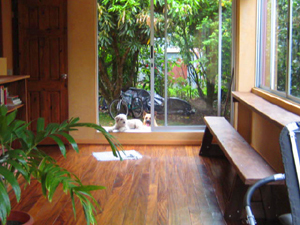 The present owners rent the second-floor apartment regularly by day, week, or month. 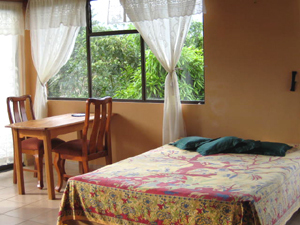 Since it is only a few minutes from the two windsurfing/kitesurfing centers at the north end of the lake, the apartment is especially desired during the windsurfing season December through March, and the rates are higher in those months. The owners also point out that the home can easily be divided into three areas and thus could have two or three apartments. 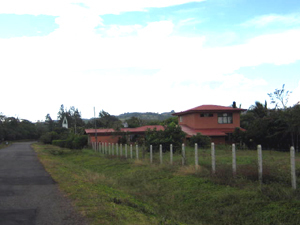 The home is about 20 minutes from Tilaran. The bucolic village of Sabalito is small and attractive with long lake and mountain vistas. Hidden among the roadside woods are quite a few Gringo residences. A couple of minutes away is La Mystica Hotel with its very appealing Italian restaurant. 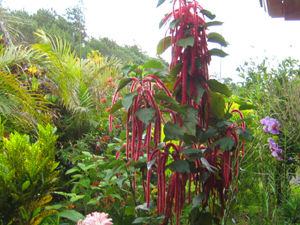 The half-acre contains a wealth of tropical flowering plants as well as many fruit trees, including mango, orange, mandarin, banana, grapefruit, limon, cas and pipa trees. The main living areas in the house total 1,808 square feet. The total including the storage rooms and carport is 2,346 square feet. Arenal Volcano, over 20 miles away, demonstrates its active status in this view from the second-floor apartment. 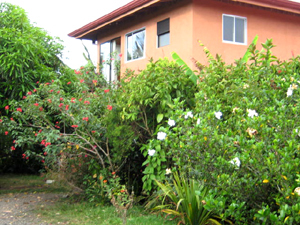 The home, with carport and storage to left, is conveniently close to the paved road. The second-floor apartment is designed to enjoy the lake and mountain views. A large, tiled carport provides covered access to the entry in the wide porch. 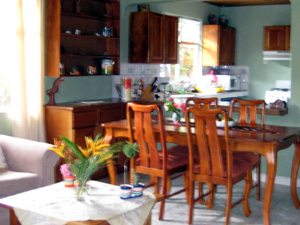 The main floor has a open design for the kitchen, living, and dining areas. The main floor living area. One end of the large multi-purpose room. 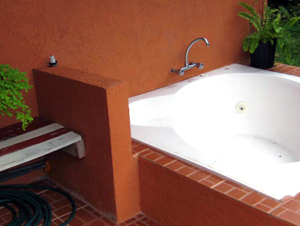 A jacuzzi is outside the multi-purpose room. 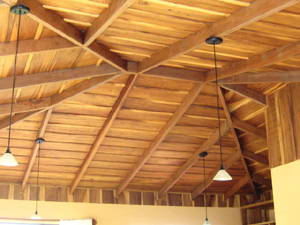 The apartment has a nice beamed ceiling. 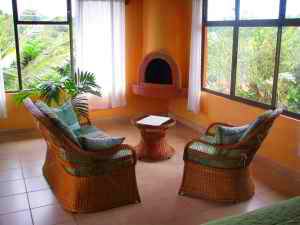 The apartment contains 2 full-size beds, sitting area with fireplace, kitchen, and bathroom. 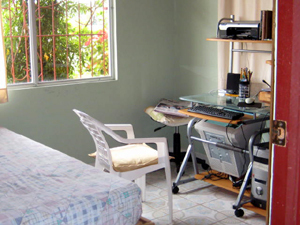 One of the 3 first-floor bedrooms also serves as the computer center. 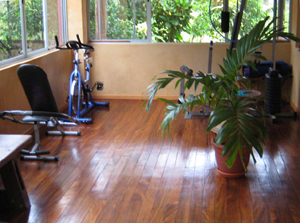 The multi-purpose room merges the indoor and outdoor assets of the home. 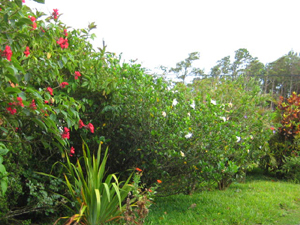 Surrounding the home are park-like grounds with many flowering tropical plants as well as many fruit trees.